Home » Arabia, Africa. Tuareg Warrior. Historical clothing. Arabia, Africa. 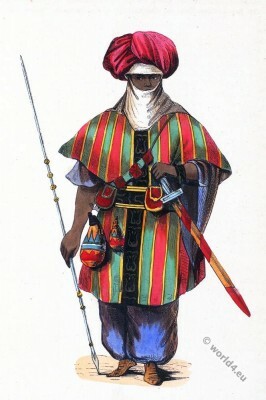 Tuareg Warrior. Guerrier de Tuarick. From the book: Manners, customs and costumes of all peoples of the world, based on authentic documents and the most recent trips by Auguste Wahlen, Knight of several Orders. Engrapher: François Pannemaker (1822-1900). Theophile Emanuel Duverger (1821-1894). Published: Brussels, 1843. This entry was posted in 19th Century, Africa, Arabia, Middle East and tagged Auguste Wahlen, Traditional Arabian costumes on 5/31/15 by world4.